Construction Started February 2018 - Official Groundbreaking February 21st. MP Wayne Long, Hon Rick Doucet, Bill MacMackin, Frank Mccary, Mayor Don Darling. Construction has started and we are now on schedule for the completion of our facility in the Fall of 2019. The Greater Saint John Field House Project is proud to announce the support of three of Saint John’s surrounding communities. Over the past year the councils of Grand Bay-Westfield, Rothesay and Quispamsis each voted to provide funding for the Fieldhouse. It is one of the first times that all three of these communities have united in their support of the same community fund raising campaign. “As a region, we benefit when we can partner together to support joint projects, and Grand Bay-Westfield is proud to make a $10,000 contribution to the capital campaign,” said Mayor Losier of Grand Bay-Westfield. Rothesay has also made a $5000 contribution to the Fieldhouse. " While not one of our community priorities, Council recognized the volunteer effort that has gone into this project, and the many people who will benefit. We wanted to show support for those volunteers and for regional recreation" said Mayor Nancy Grant. “We are very proud to add the surrounding towns to our donor list,” says Bill MacMackin, Fieldhouse President. Phase one involves the construction of all the field house components plus some site improvements for the Exhibition Park property is expected to begin in late 2017 and be open for use in the fall of 2019. The Greater Saint John Field House Project, is proud to announce the support of three of Saint John’s most notable prominent hotels and the city’s hotel association. The Best Western, Delta Hotel and the Hilton in partnership with the local Saint John Hotel Association have come together to contribute $10,000 from each hotel and a matching contribution of $30,000 from the hotel association. The field house project will feature two turf pitches for field sports, a running track, a community centre and daycare, and multi-purpose space for the community to use. These latest donations increase the community commitment helping push the project to a total of over $23 Million. The hotel association saw great opportunities to increase our sport tourism business and the members are pleased to support the field house through matching donations made by their members. “These latest donations just reinforce this facility’s potential to attract sporting events and its value to the hotel industry,” says Bill MacMackin, Project Leader. The Greater Saint John Field House Project is pleased to announce another donation this time from the RBC Foundation who have committed $10,000 to the project. “We are thrilled to welcome the RBC Foundation to our donor family and thank them for supporting this important project in Saint John. Their donation takes us a few steps closer to our goal which is to have the facility fully funded and under construction by this fall,” says Bill MacMackin, Project Leader. The Greater Saint John Field House project and Exhibition Park Association hosted an open house for the neighbours with over 30 people attending. Those in attendance received a briefing on the project and the business plan behind plus the site improvements to manage storm water and provide park space. Dan Glenn of Glenn Group provided an overview of the site improvements such as the storm water management area and park space. Subway Franchisees of Saint John area donate $12,000 to the Greater Saint John Field House Project. Bill MacMackin, Carol Fortune, Peter McMaster, Frank McCary & Tony Ratchford. The Greater Saint John Field House Project is pleased to announce another donation from our local business community. Local Subway franchisees Carol Fortune, Peter McMaster and Tony Ratchford, have combined forces to commit $12,000 to the project. Together, this group of local business people operate twelve Subway restaurants in the Saint John market and have pooled their resources to make this generous donation to the field house capital campaign. “We are very pleased to support the Saint John community with this important project,” said Peter McMaster. “The Saint John area is our home, and the field house will help in making our region a destination for sports,” added Tony Ratchford and Carol Fortune. The field house project will feature two turf pitches for field sports, a running track, a community centre and multi-purpose space for the community to use. It requires that half of the $24 Million needed, be generated from the community and City funding with provincial funding, and federal funding making up the other half. The donation from this latest contribution further increases that community commitment which is now approaching $10.8 million. “This latest gift demonstrates that local businesses of all sizes want to support this project and for Subway it just seems to align strongly with their brand and the location of their restaurants. We are thrilled that Peter, Carol and Tony have seen fit to support our drive to build a top-class sports facility here in our region,” says Bill MacMackin, Project Leader. Phase one involves the construction of all the field house components plus some site improvements for the Exhibition Park property. In future, a second phase could include much-needed infrastructure requirements for the city, including a sports arena with two ice pads and act as a replacement for ageing community rinks. Dr Neil Manson presents the donation cheque to Bill MacMackin of the Greater Saint John Field House Project. The Greater Saint John Field House Project is proud to announce a $10,000 donation from Dr Neil Manson and Sharon Manson. The field house project will feature two turf pitches for field sports, a running track, a community centre, and multi-purpose space for the community to use. It requires that half of the $24 Million needed, be generated from the community and City funding with provincial funding, and federal funding making up the other half. This donation from further increases that community commitment which is now approaching $10.8 million. SAINT JOHN, NB, FEBRUARY 20, 2017 - The Saint John Field House project Board of Directors is pleased to announce a $25,000 contribution from Moosehead Breweries. The donation brings the $24 Million project one step closer to fruition. Although work continues to secure the other half of the project funding, which will come from the Province of New Brunswick and the Government Canada, MacMackin is hopeful construction will begin in 2017. Phase one of the facility will feature two turf pitches for field sports, a running track, a community centre and multi-purpose space for the community to use. It will also include numerous site improvements for the Exhibition Park property. The McCain Foundation makes $50,000 donation to the Greater Saint John Field House Project. The Greater Saint John Field House Project is proud to announce the support of The McCain Foundation, a private foundation funded by McCain Foods Limited, which has contributed $50,000 to the field house capital campaign. The field house project will feature two turf pitches for field sports, a running track, a community centre and daycare, and multi-purpose space for the community to use. It requires that half of the $24 Million required, be generated from the community and City funding with provincial funding, and federal funding making up the other half. The donation from The McCain Foundation further increases that community commitment which is now approaching $10.7 million. The Greater Saint John Field House Project is proud to announce the support of one of New Brunswick’s most major sports governing bodies, Soccer NB which is throwing their support behind the project. The field house project will feature two turf pitches for field sports, a running track, a community centre and daycare, and multi-purpose space for the community to use. It requires that half of the $24 Million required, be generated from the community and City funding with provincial funding, and federal funding making up the other half. This latest donation increases that community commitment which now over $10.5 million. Phase one of the facility involves all the field house components plus some site improvements for the Exhibition Park property. In future, a second phase could include much-needed infrastructure requirements for the city, including a sports arena with two ice pads and act as a replacement for aging community rinks. Hilton Saint John Donates $10,000 with a matching donation from the Saint John Hotel Association to bring the total contributed to $20,000. Thank you to the Lawyers at Brenton - Kean for a generous donation of $5000. Saint John • The City of Saint John is hoping a regional recreation strategy can be a catalyst to replacing four aging rinks. As part of endorsing the Fundy Regional Services Commission’s regional recreation plan, council will push for the commission to use this initiative to develop an ice strategy for the greater Saint John region. The recreation plan, spearheaded by the Fundy Regional Service Commission, would see greater collaboration between communities and possible cost sharing when planning any future facilities in the greater Saint John region. Four city arenas, Charles Gorman, Hilton Belyea, Peter Murray, and Stewart Hurley, are nearing the end of their useful lives. The city estimates that it has about five to 10 years left before it has to replace them all and wants to be in the position to do so before their time is up, said Tim O’Reilly, deputy commissioner of parks and public spaces. Thirty-five per cent of the users of Saint John’s arenas come from outside the city, O’Reilly pointed out. “It’s not going to impact just Saint John alone to not have these rinks, it’s going to impact the entire region,” he said. O’Reilly’s report argued that the ice surfaces for the proposed Exhibition Park field house fit well with both the city’s desire to replace its rinks and the goals of a regional recreation strategy. Phase 1 of the facility will feature two turf pitches for field sports, a running track, a community centre and daycare, and multi-purpose space for the community to use. Phase 2 of the project includes a sports arena with two ice pads. Bill MacMackin, board chairman of the field house project, said the whole purpose of including two ice pads as part of plans for the facility was to give the city a viable option to replace these arenas when their lifecycles came to an end. He added that he thinks the facility’s proposed location in east Saint John is well placed to replace them. The sooner the city can come up with a plan to do so, the better, he said. “It will take a number of years to flesh out a project like this and get it through to completion. Five to 10 years on the old arenas seems like a long time, but they fly by very quickly,” he said. 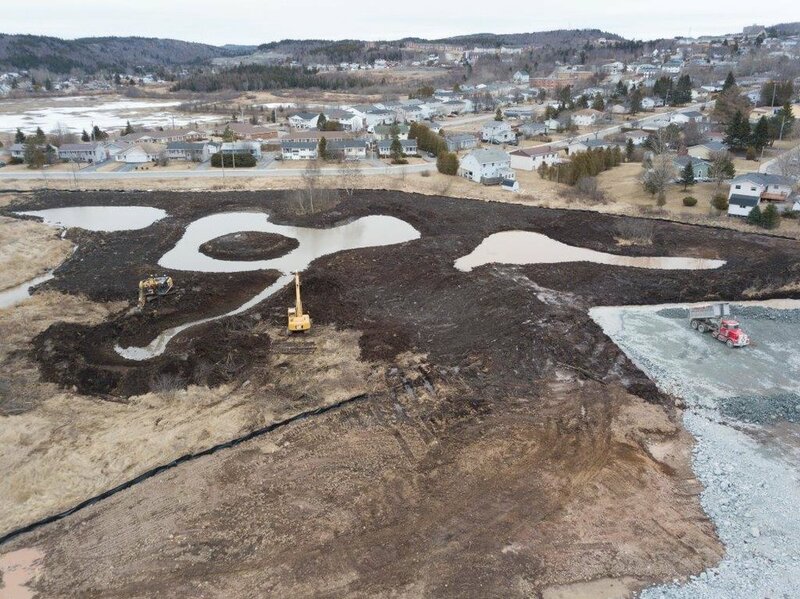 The proponents of the project have always presented it as a regional facility, even though it would be located in Saint John, he said, adding that they’ve reached out to different communities to ask for capital contributions. On Monday, council also confirmed its support for $24-million complex. The city has committed to provide $4.2 million in funding over three years. MacMackin said he was “very pleased” to hear council affirm its commitment, adding that the project’s board has been responding “quite regularly”to city staff questions about it. “We’re respectful of their expertise and working very hard to build those ideas into our own operating strategy,” he said. The project’s board has thus far raised $10.3 million of the $12 million it needs in community fundraising for the project. That figure includes the city’s contribution. The plan requires that provincial and federal funding make up the other half. One councillor did raise some concerns with using the ice strategy as the regional plan’s first project. Greg Norton said he was concerned that using arenas to test out the initiative, rather than something like a trail system that connects communities, would be divisive. “At the very start of it, before the conversation gets started, you have to decide where that rink is going to be built,” he said. Coun. Gary Sullivan said he agreed with Norton’s point, arguing that if the plan’s goal is to encourage regional co-operation, it might have more chance of success if its first project focuses on something that connects communities. The Fundy Regional Service commission will vote on whether to move forward with the recreation plan on Dec. 14.